Records are important whether they are business or personal and storing them shouldn’t encroach on the space you have available in your house, apartment or office. We can store them so they are available whenever you should need them. We can help you reduce clutter, sometimes you just need the space available to help you get organized. We offer multiple storage units that will suit your needs, long term or short term. We can keep your records safe until you need them again. No matter if these records are personal or business related you might not need that shoebox full of receipts until tax season, so if you find yourself tripping over them more often than not, give us a call and we can keep your records safe until they are necessary. We can also store your old school transcripts, tax returns or other important documentation. Storing your important paperwork out of your home or office also makes sense for security purposes. You won’t have to worry about them being tampered with, stolen or lost if the worst were to happen to your home or office. Let us give you the assurance you need when it comes to keeping your important records safe. 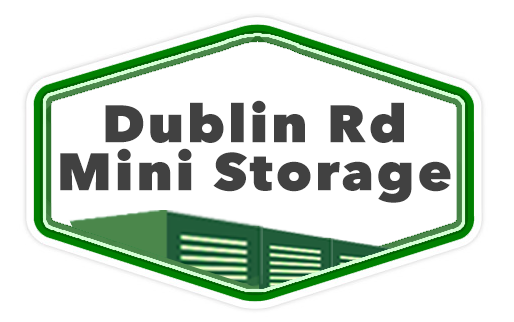 Here at Dublin Road Mini Storage, we offer our customers several time saving tips when it comes to storing their stuff. We encourage you to come up with a plan for your storage unit so all of your items are easy to access whenever you should need them, this will also help you get the most out of your storage unit. Give us a call and we’ll be happy to answer any questions you may have about your storage needs. Some of our most important documents are now stored on hard drives or old computers. If you have a couple old laptops or desktop computers that you may need later, think about storing them with us. It takes a lot of time to organize your electronic data so instead of throwing the computers away and hoping you won’t need them later, consider keeping them in a storage unit. Then when you have time, you can pull them out, dust them off and go through them at your leisure. We aim to give you the peace of mind that only a secure storage facility can provide along with the extra space you’ll have in your home with all your old electronics safe and out of the way.